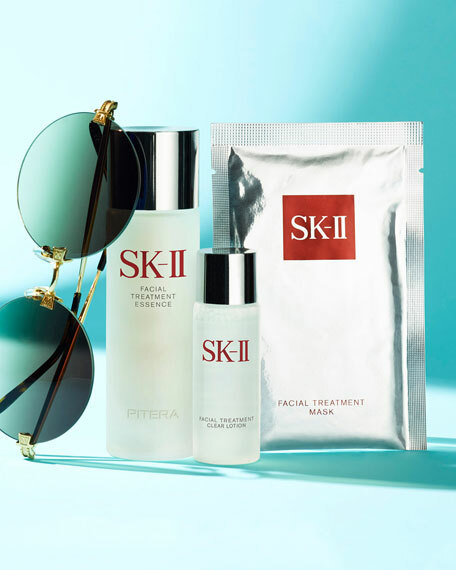 Discover a life-changing skincare regimen beginning with the signature Pitera rich Facial Treatment Essence, complemented by the clarifying Clear Lotion. It also includes the favorite Facial Mask for an unforgettably indulgent moisturizing experience. Used together, skin becomes significantly clearer, firmer, and more radiant. After cleansing, pour a few drops of the Facial Treatment Clear Lotion on a cotton pad and wipe around the face and neck. Light and watery, this toning lotion penetrates into the skin's surface. Follow up by soaking a cotton pad with Facial Treatment Essence and gently smoothing onto your face for 1 minute. For an instant and intensive boost, place the Facial Mask starting from the center and patting outwards. Leave on for 5-15 minutes. 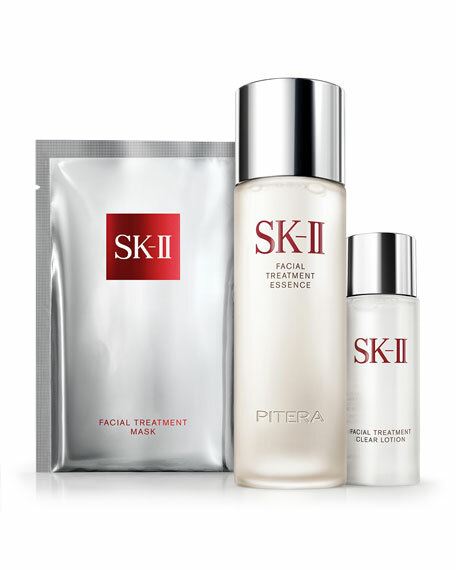 SK-II Facial Treatment Essence, 2.5 oz.